Second Man Arrested In Connection To London Attack As Trump's Tweet Rubs Officials Wrong Way : The Two-Way Police in the U.K. say they arrested a 21-year-old man late Saturday in west London. He has not yet been charged. Forensics officers investigate a property in relation to Friday's terror attack in London. The threat level in the United Kingdom was raised to "critical" after the attack, but it was lowered to "severe" on Sunday. As NPR reported on Friday, 29 people were injured at the Parsons Green subway station in Fullham when an explosion went off in a train car. The Islamic State's Amaq news agency said the militant group was responsible for the attack, but that claim could not be independently verified. Police arrested an 18-year-old on Saturday in Dover as well, in connection to the "cowardly" Friday rush hour attack, as British Prime Minister Theresa May called it. "Photos posted on social media show a white plastic bucket with flames coming out of the top — along with wires," NPR's Frank Langfitt reported for our Newscast Unit. "The bucket is sitting next to a subway train door. A purse, apparently abandoned by a fleeing passenger, sits in the foreground." 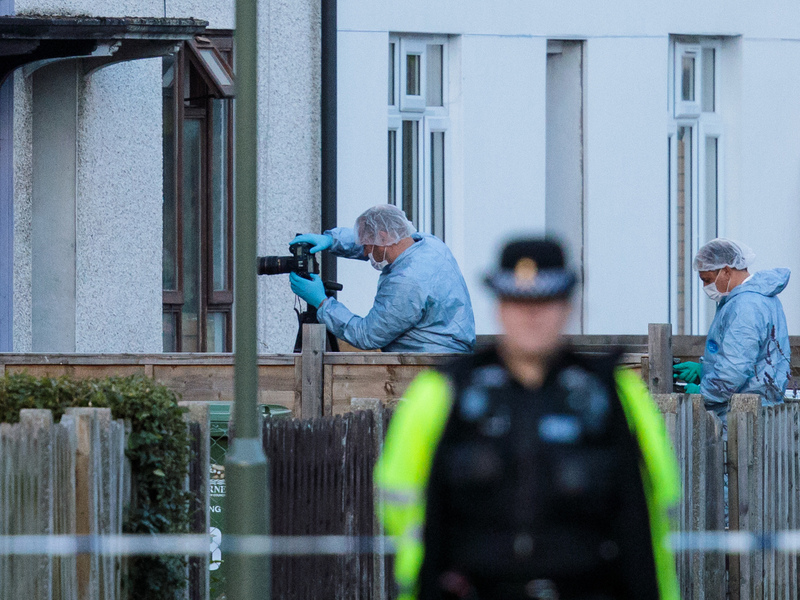 On Sunday morning, authorities were searching a property in Stanwell, a suburb southwest of London, in connection to the second arrest. They also earlier searched a property in Sunbury in relation to the first arrest. "A friend, Alison Griffiths, said they are 'great pillars of the community' who have taken in several hundred children in the last 40 years. "The entire neighborhood around their house was evacuated as a precaution when the search began Saturday. Residents were allowed to return home Sunday but the Jones' house remains cordoned off." President Donald Trump has also riled a bit of tension as authorities in the U.K. continue their investigation. Trump tweeted that the perpetrators of Friday's attack were "in the sights of Scotland Yard." Britain's Home Secretary Amber Rudd, called the comments unhelpful and "pure speculation," according to The Guardian. When asked if her comments could be construed as a message to the president to stop tweeting, Rudd responded, "I don't think I'd be the first person to say that, would I?" "We don't want any speculation on an ongoing operation," she added. The threat level in the United Kingdom was raised to critical immediately after the attack, meaning another attack was "expected imminently," but it was lowered to severe on Sunday.